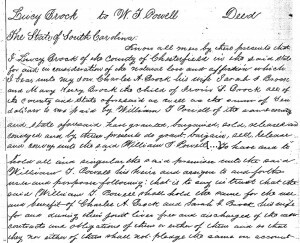 Reader Charlie Purvis carefully and painstakingly transcribed a four-page deed from 1880 involving three town lots and other land interests in Cheraw, Chesterfield County, South Carolina, and even after he finished the transcription, wasn’t quite entirely sure just what the land deal was all about. The problem was that the deed used a term he hadn’t come across before — it referenced the creation of Cestui Que Trusts. Let’s go over this land deal, because it’s the context here that helps understand the term. So right here at the beginning, we have two things going on. First, in the usual legal language (“granted, bargained, sold, released and conveyed”), Lucy transferred legal title over the town lots and her interest in other properties to one William T. Powell of Chesterfield County. But the consideration — the price paid — was her “natural love and affection” for three people: her son Charles, his wife Sarah and a third Brock family member, Mary Brock. That’s an immediate signal that this isn’t a routine “I’m selling, you’re buying” type of land deal. Okay, here we’ve got two very big restrictions. First off, while Powell got legal title to the land, he wasn’t the owner in fee simple. He couldn’t sell it, give it away, leave it in his will for use as a home for wayward cats. He was a trustee, holding title but only in trust for the use and benefit of Lucy’s son and daughter-in-law, for their joint lives and thereafter for the life of the survivor of the two. And note the restriction on the son and daughter-in-law: they couldn’t encumber the land in any way. They couldn’t mortgage it, or pledge the land as security for any kind of debt. Clearly, Mama was a little concerned about Sonny and his wife here. 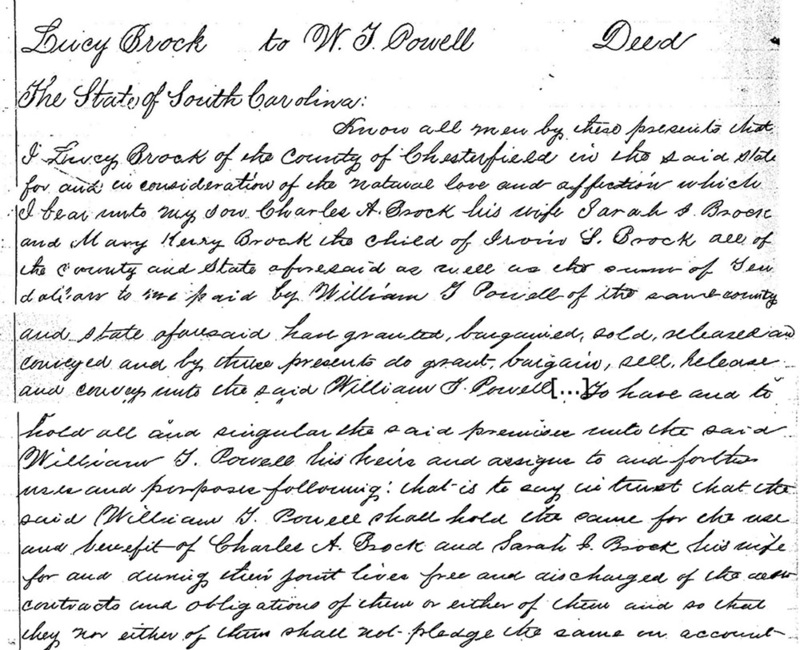 We know from this language that Mary Kezzie Brock (called Mary Kerry Brock in an earlier paragraph) was living with Charles and Sarah as a child in their household and was to share equally with any children Charles might have — by Sarah or any other wife — if she continued to live with them (unless she married). Notice that the land is still supposed to be in trust, however. Nobody in the Brock family was yet to have legal title to this property even after Charles and Sarah died. So… what’s a Cestui Que Trust? Purely and simply, the beneficiary of an estate held in trust. Here, Charles and his wife Sarah and Mary Kezzie Brock were the Cestui Que Trusts of this deed. The term is legal French this time, as opposed to legal Latin. Imported to England and the common law by the Normans, to the total infuriation of American legal lexicographers. So, in “bunny rabbit English,” it’s not English at all — it’s a “barbarous” “uncouth” holdover from the Norman French. Think “beneficiary of an estate in trust” instead. After all, you wouldn’t want those American law dictionary authors to be spinning in their graves. Thank you so much for explaining this deed in simple terms. Thank you so much for sharing such an interesting question, Charlie!